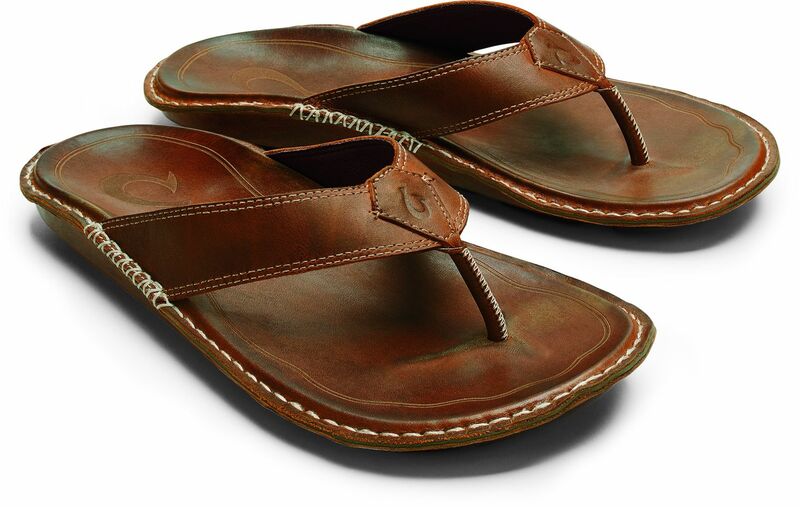 Olukai Keonimana - Men's Leather Sandals - Free Shipping. Sophistication doesn't have to be spotless. The refined-yet-rustic Keonimana handles the elements with a classic- time-worn aesthetic. In elegantly burnished and waterproof full-grain leather with heavyweight hand-stitched detail- the Keonimana boasts a worn-in- artisanal quality that can only get comfier with time. Sophistication doesn't have to be spotless. The refined-yet-rustic Keonimana handles the elements with a classic- time-worn aesthetic. In elegantly burnished and waterproof full-grain leather with heavyweight hand-stitched detail- the Keonimana boasts a worn-in- artisanal quality that can only get comfier with time. Footbed: High density compression molded PU midsole wrapped in a burnished- watherproof full-grain leather provides anatomically correct contour and sustained comfort over time. Outsole: Burnished- waterproof full-grain leather wrapped outsole with non-marking rubber traction pods for enhanced grip and flexibility. Features: Polyveldt construction- heavyweight whipstitching- embossed upper logo- laser footbed detail and outsole texture inspired by the tides of change.